Harbor of Refuge No. The Harbor of Holmes' Hole. 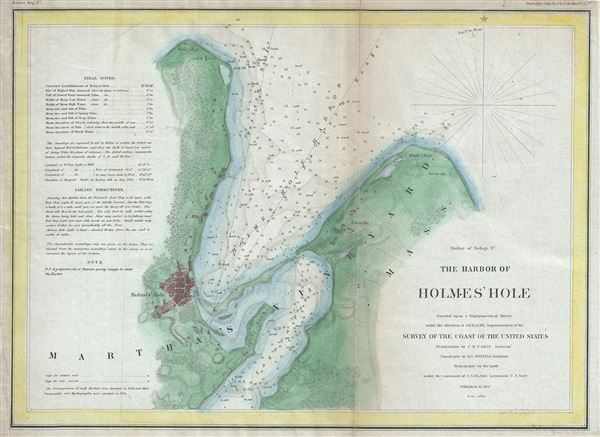 This is a rare example of the 1847 U.S. Coast Survey nautical chart or map of Holmes' Hole (Vineyard Haven), Martha's Vineyard, Massachusetts. Focusing on the town of Holmes' Hole, today's Vineyard Haven, this map covers from West Chop to East Chop and as far south as Little Neck and Lagoon Pond. It presents a rare mid-19th century view of one of Martha's Vineyard's three main population centers. This map offers exceptional inland detail noting individual streets, farms and buildings in Holmes' Hole and Eastville. Countless depth sounding throughout. The upper left quadrant features notes on tides and detailed sailing instructions. The triangulation for this chart was completed by C. M. Eakin. The stunning topographical detail is the work of H. I. Witing. The hydrography was completed by a party under the command of G. S. Blake. The entire chart was produced under the supervision of A. D. Bache, of the most prolific and influential Superintendents of the U.S. Coast Survey. Report of the Superintendent of the United States Coast Survey, (Washington) 1847. Very good. Minor wear and toning along original fold lines. Minor spotting. Backed with archival tissue for stability.